The FBI blacked out large portions of communications about the application for a wiretap of a former Trump campaign volunteer and is refusing to un-redact the information, the chairman of the House Intelligence Committee said. Additionally, the FBI has resisted Rep. Devin Nunes’ demand to make documents on the wiretapping of Carter Page available to lawmakers. He said that in February the FBI refused to give committee members access to the wiretap application authorized under the Foreign Surveillance Intelligence Act (FISA). In an April 4 letter to the Justice Department, the California Republican gave the DOJ until April 11 to comply with demands for the communications. 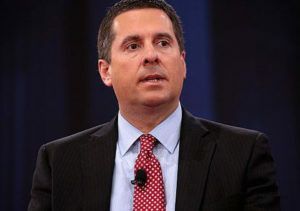 “Be advised that failure to comply in a satisfactory manner will result in the committee pursuing all appropriate legal remedies, including seeking civil enforcement of the August 24 subpoenas in federal district court,” Nunes wrote. “This arbitrary resistance to legitimate oversight is unacceptable,” Nunes wrote. Nunes sent the letter to Deputy Attorney General Rod Rosensteinand FBI Director Christopher Wray. In an April 5 report for The Washington Times, Rowan Scarborough noted that Nunes “has previously disclosed that the bureau relied heavily on the Christoper Steele dossier, paid for by the Democratic Party, to obtain nearly a year’s worth of surveillance” on Page. Nunes “gained the information from a reluctant FBI only after issuing subpoenas and gaining the intervention of House Speaker Paul Ryan. But since then, the FBI has shut the door again,” Scarborough wrote. Republicans have ended the Intelligence Committee’s investigation into alleged Trump-Russia election collusion, concluding that they found no coordination in Russians hacking Democratic computers.